HCM CITY (VNS) — A charity on Friday unveiled the Luong Van Can Scholarships for university students in Viet Nam and abroad and solicited donations from businesses and individuals and fee waiver from universities. 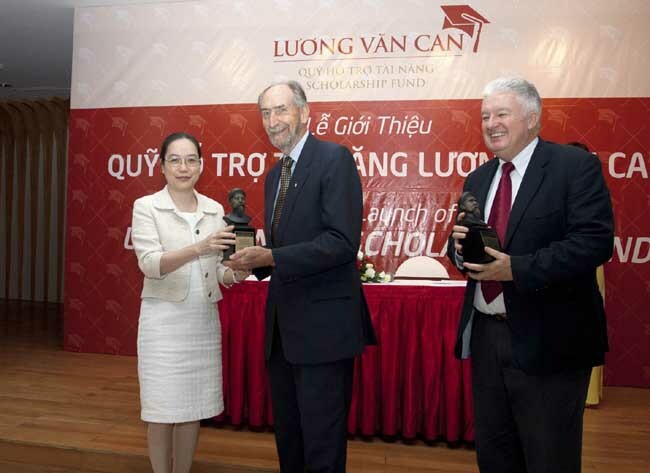 The Luong Van Can Scholarship Fund (LCVF) will first begin to provide scholarships to study in Australia. A majority of the scholarships will be earmarked for disadvantaged students. The non-profit will co-operate with many local and foreign universities to provide full and partial scholarships and with a broad spectrum of Vietnamese businesses and industries to provide work placement for students. It will also support local universities with organising conferences and seminars to enhance leadership and management skills in higher education in Vietnam. It has so far raised VND10 billion (US$476,190) for its activities. Universities in Australia, the USA and Singapore are working on more details to provide full scholarships and tuition fee waivers for LVCF.